Pro Football Weekly hears that another potential free-agent quarterback who might appeal to the 49ers is the Steelers’ Dennis Dixon. If the free agency rules are retained from the last CBA, Dixon would be a restricted free agent, meaning the Steelers get the right of first refusal and in Dixon’s case, a fifth-round choice if he signs with another team. Dixon, the former Oregon star, is fully recovered from a severe knee injury he incurred in college. However, if Dixon was really impressive, the Steelers would have protected him more. Then again, the team seems like they still have hopes for Dixon, but they already have a QB making over $100 million, and Byron Leftwich is going to be the backup for another season. In other words, if the Niners want him bad enough, he will be elsewhere in 2011. 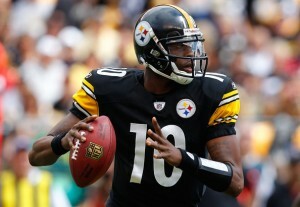 1 Comment on "Report Says San Fran High on Steelers FA QB Dennis Dixon"
If he’s gone, he’s gone. If i had a single druther with the Steelers and their player personnel (and it is infinitesimal based on the success of the franchise), it would be to deal certain players for draft pick sin lieu of accepting the obligatory compensatory picks when players walk in free agency. Develop and trade, albeit a small portion of the team’s MO, should still be considered in my humble opinion.